Surviving in the free lance environment of a large city is a tough act. One performer who has withstood its rigors is Los Angeles percussionist Joseph Mitchell, III. 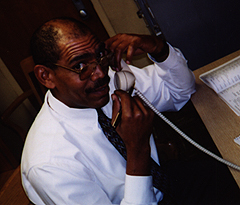 Reared in Southern California, Joseph Mitchell has worked in studios and concert halls throughout the Los Angeles area and is an active educator at several institutions. Mr. Mitchell was educated at California State University, Northridge where he studied with Karen Ervin and Joel Leach. Upon graduation, he served in the United States Army with the Signal Corps Army Band at Ft. Gordon, Georgia. From 1984-88 he studied at the University of California, Los Angeles with Mitchell Peters where he received the Master of Fine Arts degree. Currently he teaches music at Los Angeles City College and has been on the faculties of California State University, Dominguez Hills, California Polytechnic University, Pomona, El Camino College, California State University, Los Angeles, and Santa Monica College. Joe Mitchell has performed with many orchestras including the Los Angeles Philharmonic, Long Beach Symphony, Los Angeles Opera, Pasadena Symphony, Santa Barbara Symphony, and the Glendale Symphony. He has also worked with Aretha Franklin, Gladys Knight, Lou Rawls, Marilyn McCoo, Richard Smallwood, and blues man Mighty Mo' Rodgers. He can be heard on Mikki Howard's release Femme Fatal and as featured percussionist with the duo Judicanti Responsura on Juneteenth. Also included in the discography of Mr. Mitchell are recordings of Bernard Herrmann's film music and Night of the Mayas by Mexican composer Silvestre Revueltas with the Los Angeles Philharmonic on Sony Classical, as well as Glenn Horiuchi's Elegy for Sarajevo, on the Asian Improv label. He worked on the soundtrack to the motion picture Cora Unashamed, performing the music of Patrice Rushen. Listen! Joe Mitchell has a couple of concerts coming up in early 2012 (Jan. 28 and Feb. 23) featuring his compositions and Judicanti Responsura. Check out the Events page for details. Joseph Mitchell's new CD Songs of the Diaspora can be sampled and purchased from CD Baby.